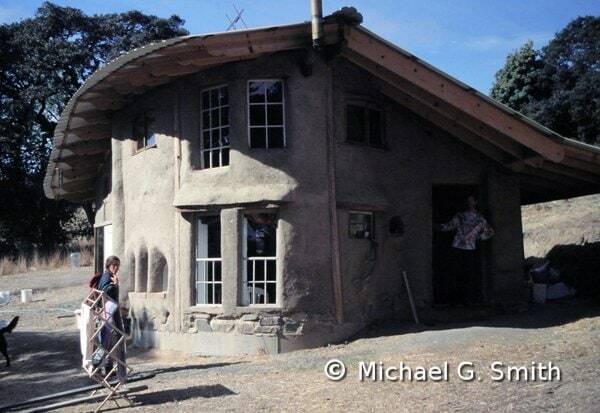 This hybrid passive solar home in Northern California was designed by Michael G. Smith. The north wall (far right) is straw bale for insulation; the other walls are cob for thermal mass and sculptural appeal. “Hybrid” refers to the practice of combining multiple wall systems in the same building. There are many good reasons to do this; I’ll mention just a few. 1) For effective passive solar design, you need both thermal mass and good insulation in different parts of your home. The interior walls, the floor, and sometimes the south wall should be made of high-density materials like cob, adobe, or stone. For the other exterior walls, an insulating wall system like straw bale or straw clay is usually preferable. 2) Different wall systems have their own natural geometries. For example, straw bales are large rectangular blocks. While it is possible to cut and retie bales into other shapes and sizes, it may be more efficient to use a different wall system where you want a thinner wall or one with many openings close together. 3) Although the differences can be smoothed over in the finishing stages, each wall systems has its own look and feel. You might want a curvaceous, sculptural wall in one part of your house, let’s say around the hearth in the living room. If so, choose cob. In another area you might want a straight, flat wall to build bookshelves up against, so you opt for straw clay. Different materials lend themselves to different forms. 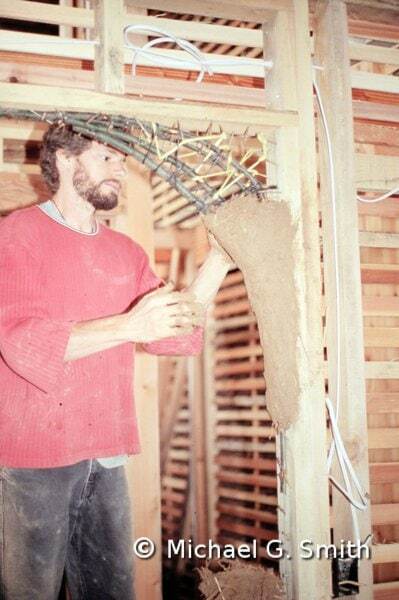 Here I am using sticks, clay, and straw to arch an opening in a stud-framed slip-and-chip wall. Although they have many practical and aesthetic advantages (not to mention providing more learning opportunities in workshops), hybrid homes also have their own set of challenges. It is very important to get good strong connections between the different wall systems, especially in seismic zones. Since almost all the natural buildings I’ve designed and built during the last fifteen years have been hybrids, I have a lot of experience with this sort of problem solving.